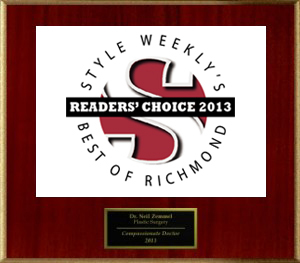 Dr. Neil J. Zemmel is a skilled plastic and reconstructive surgeon who prides himself on consistently achieving beautiful, natural-looking results for his patients here at Dermlounge and Richmond Aesthetic Surgery. He strives to be the best plastic surgeon possible, helping patients transform their self-confidence and attitude towards life by addressing the physical areas that concern them the most. 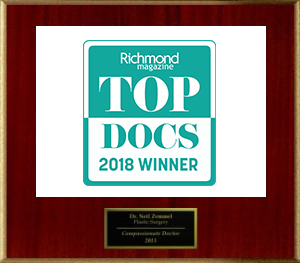 A board-certified plastic surgeon, Dr. Zemmel’s work has been published in a number of respected medical journals, and his insight has been sought for a variety of television and print media stories covering issues related to plastic surgery and cosmetic enhancement. He is particularly well-known throughout the Richmond, Virginia and Mid-Atlantic areas for his expertise in performing breast augmentation and advanced breast revisions and reconstruction. 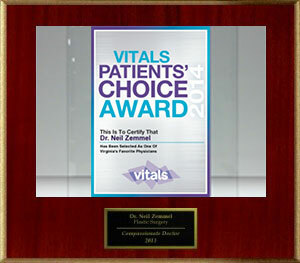 Dr. Zemmel has also lectured on several plastic surgery topics, including the latest techniques on facial rejuvenation with cosmetic injectables, breast reconstruction, and liposuction. 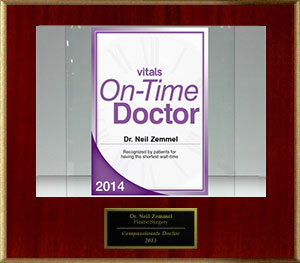 In addition to cosmetic surgery, Dr. Zemmel is also known for his experience with reconstructive surgery. He offers a range of advanced breast reconstruction options, and has also helped patients suffering from severe burns, traumatic injuries, and congenital defects. 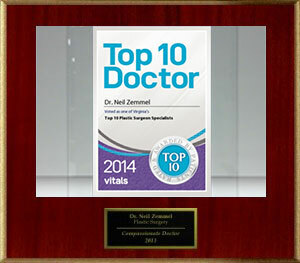 His remarkable wealth of skills in general surgery, reconstructive surgery, and plastic surgery make Dr. Zemmel one of the area’s most experienced plastic surgeons. 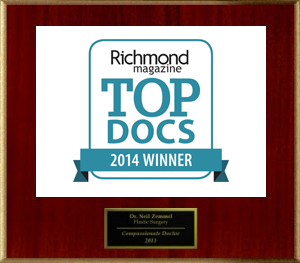 Dr. Zemmel studied at the prominent College of William and Mary for his undergraduate education in fine arts and science, where his work was recognized with several scholarships and awards. Following his time at William and Mary, Dr. Zemmel went on to complete medical school at the University of Virginia School of Medicine. After studying all medical disciplines, he scored an impressive 98% on the United States Medical Licensing Exam Part I. After medical school, Dr. Zemmel completed a highly competitive 6-year plastic and reconstructive surgery program at the Virginia Commonwealth University Medical Center, where he scored in the 90th percentile on the General Surgery In-Service Exam. In his last year of plastic and reconstructive surgery training, he served as Chief Resident of Plastic Surgery and scored in the 92nd percentile on the Plastic Surgery In-Service Exam. His research has been published in several peer-reviewed medical journals. Upon completion of his medical and surgical training, Dr. Zemmel went into private practice for plastic surgery in Miami Beach, Florida. He then returned home to Virginia to open Richmond Aesthetic Surgery and Dermlounge. 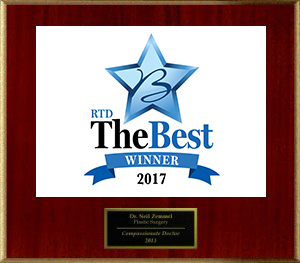 In 2016, Dr. Zemmel was selected by Allergan along with four other plastic surgeons to participate in a special preceptorship in Stockholm, Sweden, training under Dr. Charles Randquist. During this trip, Dr. Zemmel received hands-on training with advanced cosmetic breast surgery, for which Dr. Randquist has become world-renowned for his skill. Regarded as an authority in plastic surgery, Dr. Zemmel has been featured in several media stories to educate the public on the latest advancements in the industry. He has introduced VASER® liposuction in a news segment on NBC 6, presented details about SmartLipo® for a news story on Fox 29, and was quoted within a New York Times article for his experience using the online tool known as Zwivel™. 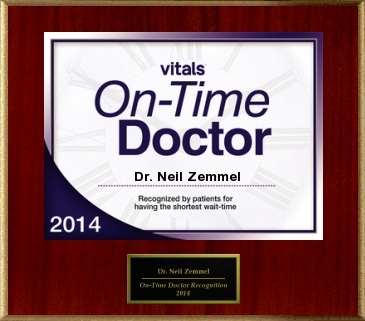 Additionally, Dr. Zemmel has had the opportunity to share inspiring patient stories that aired on different television programs. This has included cases he has completed pro bono, including a complex body contouring procedure after a teenager’s major weight loss for the talk show The Doctors, and a news feature for NBC 12 on breast revision surgery for a domestic violence victim’s ruptured implant. 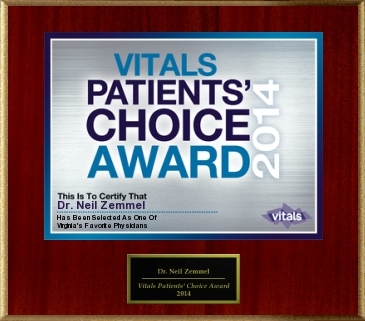 Dr. Zemmel is certified by the American Board of Plastic Surgery. He is a member of the American College of Surgeons, the American Society for Aesthetic Plastic Surgery, the American Society of Plastic Surgeons, and the Medical Society of Virginia. 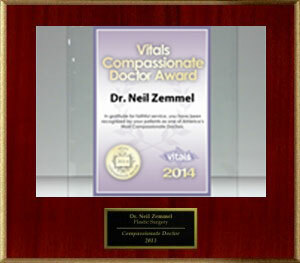 Dr. Zemmel is also a Fellow of the American College of Surgeons, and has been designated a Diplomate of the American Board of Plastic Surgery. For more information, or to schedule a consultation here at Dermlounge to discuss your goals, please contact our practice today.